$6.004 million on 2033 screens. Though someday James Franco may emerge as a box office draw, so far he’s not done well. Sure, he appears in the hugely successful Spider-Man flicks, but that’s in a supporting role; when he takes the lead, he fizzles. Annapolis? $17 million gross. Tristan + Isolde? $14 million. 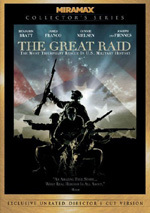 The Great Raid? $10 million. And so it goes. 2006’s Flyboys did nothing to change Franco’s fortunes as it ended up right in the same ballpark as the others. Its $13 million gross seems predictable after we see the figures for his prior flicks. I wish I could claim that Flyboys deserved a better fate. Alas, that would be a lie, as this flick stinks something rotten. Flyboys takes us to World War I circa 1916 and the introduction of airplanes as participants in armed combat. Franco plays Blaine Rawlings, a hotheaded Texan who flees to avoid jail time after an assault. Inspired by a newsreel, he goes to France to volunteer for their air corps. We also meet some additional enlistees. These include earnest William Jensen (Philip Winchester) who promises his hometown sweetie he’ll return a hero, black boxer Eugene Skinner (Abdul Salis), and high society ne’er-do-well Briggs Lowry (Tyler Labine). They enroll in the Lafayette Escadrille and the film follows their training under Captain Thenault (Jean Reno). We meet additional recruits along with legendary pilot Reed Cassidy (Martin Henderson), the most durable and intimidating of the fliers. Eventually the flick follows all these men into action. Along the way, we see the development of their characters and their relationships with each other. Oh, and they shoot up lots of Germans. When you see Dean Devlin attached to a project as producer, you don’t expect cinematic brilliance. Best known with former partner Roland Emmerich for projects like Independence Day and Godzilla, you look to Devlin for some slam-bang action and little more. If that’s your expectation as you go into Flyboys, you might come away happy – maybe. The aerial fight sequences bring out decent action, though I think they fail to become anything other than moderately exciting. There’s too much of a videogame feeling to the staging and effects for these elements to ever truly involve us. And the fact we just don’t care about the utterly predictable characters and circumstances doesn’t help. We’ve seen each and every one of these personalities elsewhere – and many times. There’s not a vaguely original or interesting character in the bunch, as they all fall into the realm of Ye Olde War Movie Clichés. The movie gives each pilot exactly one personality trait and never does anything to develop them beyond that. These are ultra-thin characters who never intrigue or stimulate us. As was the case with The Patriot, the concentration on formula and the lack of depth makes Flyboys a disappointment. I don’t mind a wild adventure like Independence Day to de-emphasize story and character, but historical drama like this deserves better. Independence Day was able to weather its thin characters largely because it boasted a strong cast. Unfortunately, Flyboys can’t make the same claim. Each performance seems utterly devoid of personality or life. There’s no spark whatsoever to them, as we never see any reason to care for the guys. Blaine’s romance with Lucienne comes totally free of passion, and that goes for every other aspect of the movie. The actors do nothing wrong, but they can’t add anything to their roles. Flyboys doesn’t flop just because it’s trite and predictable; it’s the insane degree to which it becomes trite and predictable that kills it. I can deal with stories that follow expected trends, but this one takes the cake. It never remotely curves from the typical paths as it gives us exactly what we’ve seen a million times in the past. Does the film do anything right? Damned if I can think of any positives. I like the concentration on World War I, as it’s nice to get something about wars other than WWII or Vietnam. We could use more stories about that conflict and other “forgotten” conflicts. Too bad Flyboys so utterly fails to do justice to the source material. Burdened with awkward storytelling, dull characters, flat acting, and an absurd level of predictability, this is a tired, cliché stinker. 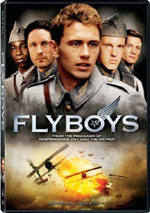 Flyboys appears in an aspect ratio of approximately 2.35:1 on this single-sided, double-layered DVD; the image has been enhanced for 16X9 televisions. Despite a few concerns, this was a generally satisfying transfer. Sharpness usually looked good. Occasionally I thought the movie turned a bit soft, but those instances didn’t occur with any frequency. Most of the flick seemed concise and detailed. No issues with jagged edges or shimmering popped up, though some edge haloes appeared. Source flaws remained absent in this clean image. As often comes with period pieces such as this, Flyboys featured a subdued palette. A gentle golden tone dominated the movie, as the colors weren’t intended to appear bright and dynamic. Within that spectrum, the hues were clear and accurate. Blacks seemed reasonably deep and dense, while shadows usually looked fine. Some low-light shots were a bit dark, but those didn’t cause notable problems. Overall, the image worked well. No complaints came from the audio of Flyboys. 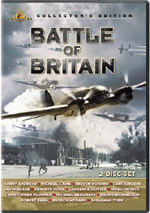 The DVD featured both Dolby Digital 5.1 and DTS 5.1 soundtracks. Though the DTS mix was a little louder, I otherwise thought the pair sounded very similar. I might give the DTS version a slight edge, but only a tiny one. Prior Devlin flicks boasted excellent soundfields and that trend continued with Flyboys. The spectrum provided a consistently engaging setting. Unsurprisingly, the flight sequences offered the best material, as the planes zipped around the room well and the bullets flew accurately. Even lower-key sequences were effective, though, as the movie always presented a concise, impressive sense of space. This was a very active five-channel package. Audio quality also seemed excellent. Speech was natural and concise, with no edginess or other issues. Music sounded lively and bright, while effects came across as dynamic and accurate. Bass response seemed terrific, as low-end was tight and deep. This was great stuff that almost made the movie interesting. Only a couple of extras round out this set. The main attraction stems from an audio commentary with director Tony Bill and producer Dean Devlin. Both sit together for this running, screen-specific chat. They discuss locations and period concerns, factual accuracy and various liberties, cinematography and shooting digitally, visual effects and visual trickery, cast and performances, story and editing, and other general production issues. Though the commentary provides a reasonable evaluation of the flick, it never becomes terribly interesting. Some of that stems from the surfeit of happy talk, but a lot also comes from the track’s superficial nature. It never digs into things beyond the surface level. Dead air becomes a problem during the movie’s second half, and that portion of the track tends to drag. The commentary gives us a passable overview and that’s about it. In addition, we get a few trailers. This area includes ads for Copying Beethoven, Last King of Scotland, Home of the Brave and The Illusionist. No promo for Flyboys appears. Throughout the commentary, you’ll hear references to additional supplements that don’t appear on this disc. That’s because there’s also a two-DVD collector’s edition of Flyboys. I presume you can find these components in that set. Not a single original, inventive or interesting moment ever crops up in Flyboys. With an emphasis on the birth of war aviation, it could have been a fascinating take on an unusual subject. Instead, it offers the same old warmed-over tripe we’ve seen 10,000 times in the past. The DVD presents very good picture and excellent audio but lacks many extras; the two-disc collector’s edition may prove more satisfying in that regard. Too bad the movie itself is such a complete failure.